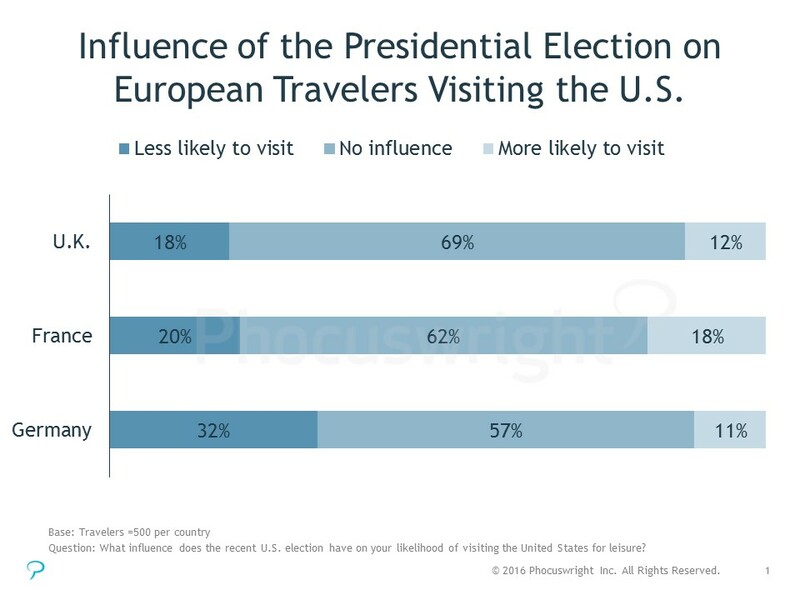 Election Impact: Some European Travelers May Be Less Likely to Visit the U.S. Politics rarely figures into the discussion at The Phocuswright Conference. But at this year's event – which took place in Los Angeles just one week after the U.S. presidential election – politics and the implications of a Trump administration for travel and tourism came up frequently both on stage and off. When asked on stage, most executives were both careful and hopeful in their statements. They cited the difference between campaign rhetoric and actual policy. Some expressed optimism, given the President Elect's background in the hotel industry, that his administration would take a pragmatic, business-friendly approach. There is, however, cause for concern. 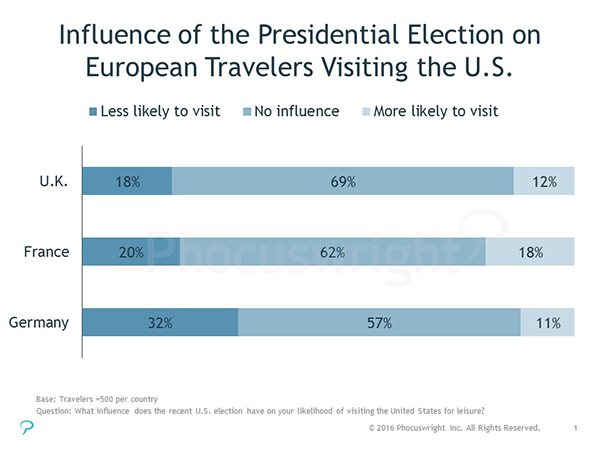 Phocuswright fielded a survey of 1,500 European travelers November 12 – 14 to gauge their sentiment around travel to the U.S. and the potential impact of the U.S. election. The results should give pause: one in five travelers in the U.K. and France and nearly one in three German travelers said they are less likely to travel to the U.S. Across all three countries, women are also significantly less likely than men to visit the U.S. – 27% vs. 19%. These results do not necessarily mean the U.S. will see a corresponding decline in European visitors in 2017. This survey does not measure actual travel behavior. It is simply a gauge of traveler sentiment at a point in time: how they feel about traveling to the U.S., and if they are more or less inclined to consider the U.S. as a destination. Some of those "less likely" travelers may indeed still come to the U.S.
Attitudes also change over time, and much will depend on the policies that the forthcoming administration actually implements. Phocuswright will continue to track this and survey European travelers again in 2Q2017 to see how attitudes are evolving. But considering a range of cautious optimism, negative sentiment among a set of European travelers, and continued questions about what the new administration will actually do, the only certainty right now is uncertainty. When asked at The Phocuswright Conference about what a Trump presidency would mean for travel and tourism, KAYAK co-founder and CEO Steve Hafner probably summed it up best: "Who the f*** knows?" Maggie Rauch, Senior Research Analyst, Phocuswright Inc.
Sign up for free access to on-demand Phocuswright Conference session videos.